To import 3D seismic data, select Survey - Import - GeoFrame - 3D. 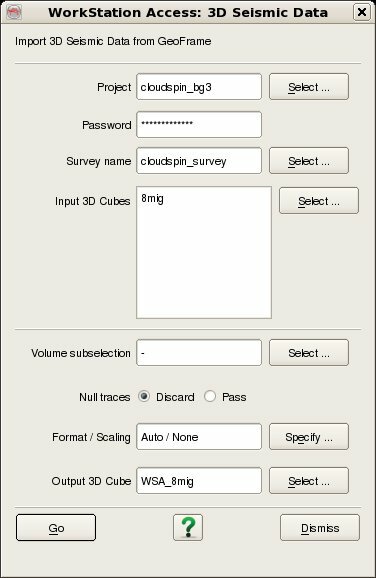 The top part of the user interface corresponds to the GeoFrame access, where it is needed to specify the GeoFrame Project, Password, Survey name and select the Input Cubes that you wish to import (For multiple selection of cubes hold the Ctrl key while selecting). The bottom part of the user interface corresponds to the OpendTect access, where you need to specify the Output Cube Name for the case of a single cube import or the Output Cube Prefix for the case of multiple cubes import. Also, you can select the full volume or a sub cube by using the Volume subselection option, and control the Format and Scaling by using the Format / Scaling dialog.